We are pleased to announce the winners of the 2018 Association for Africanist Anthropology (AfAA) Student Paper Awards. Once again, we received strong submissions for both awards and have been impressed with the focus and quality of the research. 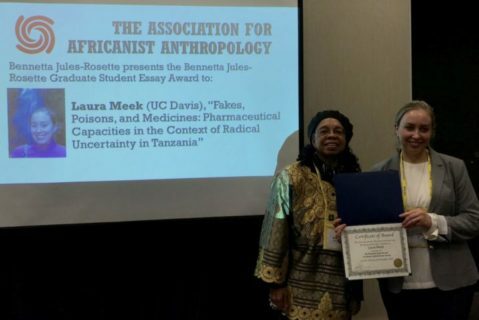 Bennetta Jules-Rosette, chair of the eponymous Bennetta Jules-Rosette Graduate Essay Award, presented the 2018 award to Laura Meek for her paper, “Fakes, Poisons, and Medicines: Pharmaceutical Capacities in the Context of Radical Uncertainty in Tanzania.” The committee recognized the strength of her ethnographic research and her innovative analysis of Tanzanian practices for assessing, deciphering, and challenging pharmaceutical and biomedical claims. Laura Meek holds an MA in Women’s Studies from George Washington University and is currently a PhD candidate in anthropology at the University of California, Davis. Her research has been supported by the National Science Foundation, the Wenner-Gren Foundation, and the Mellon Research Initiative in Reimagining Indian Ocean Worlds. Her research explores the globalization of pharmaceuticals in East Africa, embodiment and bodily epistemologies, and the ethics of healing. She conducted over two years of ethnographic fieldwork in the Southern Highlands of Tanzania, examining how pharmaceuticals were used and understood by diversely situated social actors. Her paper highlights the innovative bodily epistemologies through which Tanzanians assess, decipher, and challenge biomedical claims, and how they ultimately are able to transform pharmaceuticals, allowing these drugs to act outside the logics of biomedicine. Further, Laura frames her interlocutors’ engagement with pharmaceuticals as a form of healing that differs from the biomedical emphasis on curing. She argues that Tanzanian healing practices involve re/creating social relationships through pharmaceuticals, which she contrasts with biomedical logics of curing that locate the efficacy of medicines in their chemical properties, rather than in the contexts and circumstances of their use. Her work lies at the intersection of medical anthropology, Africanist anthropology, postcolonial studies, and feminist science studies, and grapples with how to theoretically render radical uncertainty and world-making innovation in Africa today. An Honorable Mention for the Bennetta Jules-Rosette Graduate Essay was presented to Michael Obiri-Yeboah (UC San Diego) for his paper “Domains and Directionality in Gua Vowel Harmony.” Michael Obiri-Yeboah’s essay is an anthropological linguistic analysis of the structure of the Gua language of Ghana. This essay is particularly important as an example of linguistic preservation and the archaeology of knowledge. Michael’s findings uncover patterns of vowel harmony in Gua that are highly uncommon among the world’s languages, and it therefore contributes to a broader and more global understanding of anthropological studies of linguistic patterns. The research for this work arises from Michael’s original dissertation fieldwork among Gua speakers, and we commend Michael for applying tools of formal linguistic analysis to a previously understudied African language. Committee Chair J.R. Osborn presented the 2018 Nancy “Penny” Schwartz Undergraduate Essay Award to Andrea Kvietok for her paper, “Navigating ‘Here’ and ‘There’: Migrants’ Connections to Home and Lived Realities While Abroad.” The Association recognizes the paper’s innovative analysis of migration, return, and “affective circuits.” It lays a strong foundation for future research. Andrea is a recent graduate from Macalester College, where she majored in anthropology, minored in French, and obtained a concentration in African Studies. Her research draws upon ethnographic fieldwork, conducted in Dakar, Senegal, between 2016 and 2017. Andrea’s research included extensive interviews and daily interactions with Senegalese migrants who returned home after sojourns in Europe, the United States, and/or West African countries. She also worked at a migration-related non-governmental organization that facilitates the voluntary repatriation of Senegalese nationals. In this paper, Andrea describes and analyzes Senegalese migrants’ transnational paths and journeys using a multi-actor and intersectional lens that attends to questions of gender, class, age, race, religion, and nationality. This analysis specifically engages the images and experiences migrants construct of particular places, their departures from home, their lives abroad and the connections that they maintain with home, as well as their experiences with return, reintegration, and re- emigration. Andrea plans to pursue a PhD in anthropology after returning to Senegal and completing a Fulbright Research Grant which will extend her research. We encourage you to nominate your students for the 2019 Bennetta Jules-Rosette Graduate Student Essay Award and/or the Nancy “Penny” Schwartz Undergraduate Paper Award! Deadlines for the next award cycle will be 30 June 2019, and details can be found on the AfAA website: http://afaa.americananthro.org/association-awards/. Bennetta Jules-Rosette is Distinguished Professor, Director of the African & African-American Studies Research Center at UC San Diego. J. R. Osborn is an assistant professor at Georgetown University. He co-directs Georgetown’s Technology Design Studio. Please send column ideas, photos, research updates, and other AfAA relevant info to Christian Vannier ([email protected]).